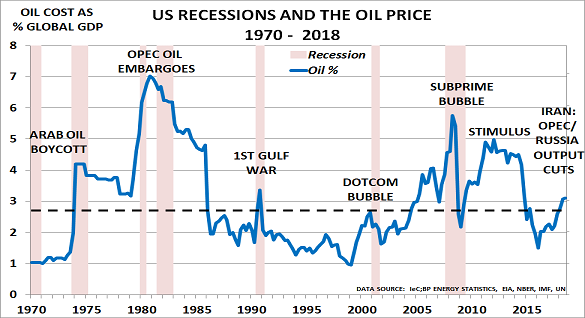 Since 1900, as the chart shows, oil prices have never been so high for so long as now. Until 2003, they had only been above $30/bbl for 4 years between 1979-1982, during the OPEC production cuts in the Iran crisis. But since 2004, they have been continuously above this level. The 2004-8 period boosted consumer demand well beyond sustainable levels, causing inflation to rise quite dramatically. Thus when the second stimulus programme began in March 2009, investors were well prepared. They rushed to buy ‘stores of value‘ – commodities such as oil, copper and gold, all priced in US$ – as well as equities. They also worried that the US Federal Reserve aimed to devalue the US$ to boost US exports and economic gtrowth. Unfortunately for all of us, this pushed oil prices back up to unsustainable levels again. But this time, due to the financial crisis, there was no demand surge. Instead, as credit was no longer easily available, people had to cut back spending. They had to heat their homes and fuel their cars, so they had less to spend on the areas that would drive demand growth. Normally high inventories, increasing supply and low demand growth would not lead to record high price levels. But these have not been ‘normal’ times. Tomorrow, the blog will discuss the risk that oil prices might now fall rapidly back to historical levels below $30/bbl. The blog is today publishing a Research Note on this critical question. Please click here to download it. A video interview with Will Beacham, deputy editor of ICIS Chemical Business, is also available by clicking here.